Here is a great opportunity to get into a highly sought after San Diego beach area location. Surrounded by an ideal mix of super dense local residential, mixed retail/commercial and huge tourist type customers, the foot and car traffic both are some of the best in the city. Restaurant is walking distance to the beach. This place is beach area location at its finest, located in one of the busiest shopping centers on one of the busiest streets in the San Diego beach community. You get the best of both worlds here, close enough to the beach to draw the tourist crowd and far enough from the beach to get the locals all year around. Keep the current concept which was on a roll with outstanding Yelp an other online reviews or convert to your own name/concept ( with landlord approval) the choice is yours. Avoid the huge time and money wasting involved with the building out of your own place. At this price with the goodwill added to the cost of your building out a place of your own, the place is a bargain! 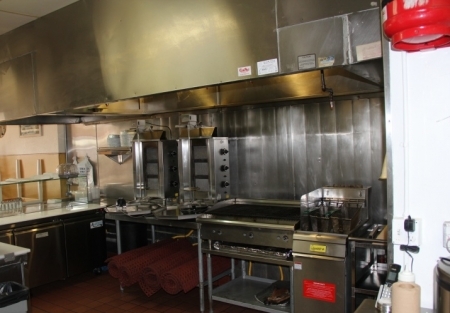 Kitchen has an eight foot hood system, grill, burner stove, deep fryer, high end Gyros machines, a walk in cooler and a cold prep sandwich station. It is ready to go. Current Greek style concept is known throughout the city for its quality, quantity and the outstanding value of their menu. Yelp reviews are truly outstanding and the sales prove it. Seller would be happy to train if you are looking to continue current operations. Seller has records to show daily gross sales of approximatley$1100 per day, with summer weekends being off the chart! Summer crowds are just around the corner; get in now to really capitalize on the numbers that are coming with them. Opened in April of 2015 verifiable sales for the eight months of 2015 was 216k or 27k per month. Sales continue to rise and with such low rent the net income after only those eight months of operations was $33,675. Community has been begging owners to add delivery. Are you ready to take this place to the next level? Restaurant space is approximately 800 square feet with a nice common patio area for customers to soak up the San Diego sunshine. Lease expires April of 2020 with a five year option available. Current rent is $1868 a month plus NNN of $432. Family emergency forces owner out the country, this location is super clean, very well received and ready for you to continue the concept that had been thriving. If Greek is not your concept, bring your own, now is the time and at this price, this is the place. Please visit our website at SellingRestaurants.com to get the name, location and photographs of this business. Cheap rent at the beach!